To prepare the tofu, drain and cut the block into 1/2" -inch slices. Place the slices onto paper towels. Cover with more paper towels and press out any excess moisture. 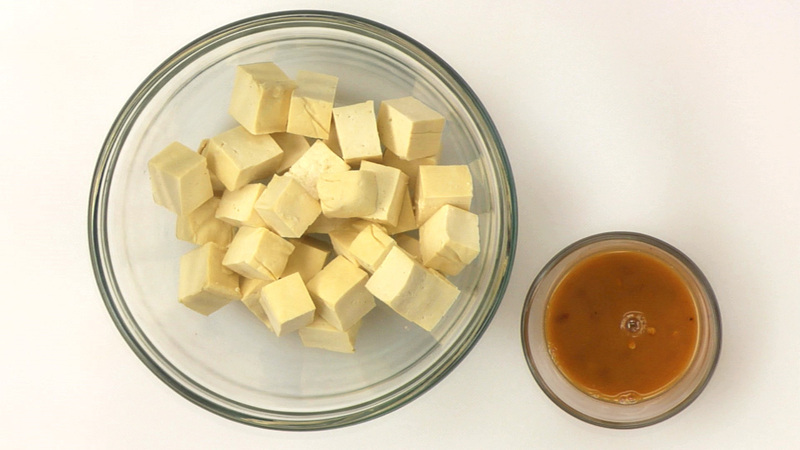 Cut the tofu into 1/2" -inch cubes. In a medium-sized bowl or sealable plastic bag, combine the remaining ingredients, stirring evenly to combine (make sure the cornstarch has completely dissolved). Cover and let marinate in the refrigerator for at least 30 minutes or up to 4 hours. Clean and trim the ends off of the mushrooms. Slice into 1" -inch pieces. Wash and spin dry the spinach. Mince the ginger and garlic. Slice the onions on the bias. Set aside. 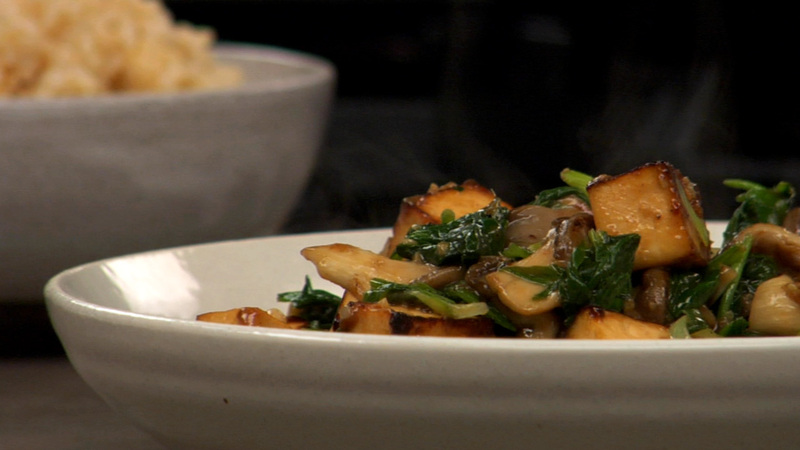 Stir-fry the tofu in batches until golden brown on all sides — set aside. 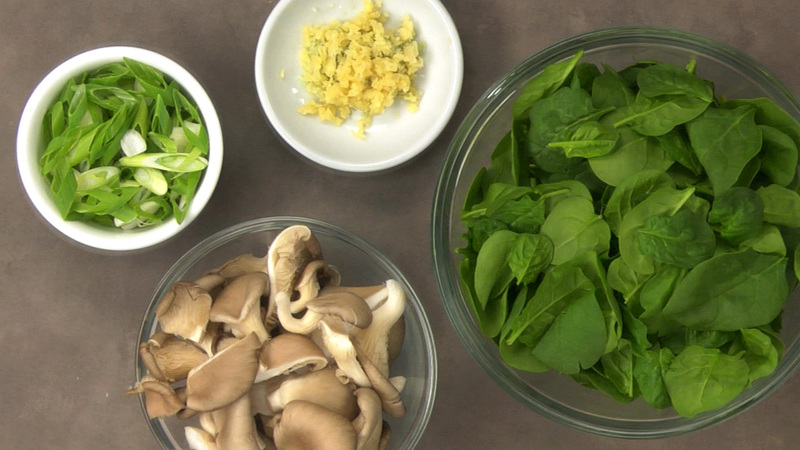 Stir-fry mushrooms — ginger and garlic — return tofu — add sauce — add spinach. Sprinkle with green onions. Feel free to add a touch more oil during the stir-frying process, if needed. Serve immediately. Just made this recipe today but had some problems. I bought the FIRM tofu but when I opened the pack a lot of it had broken up into pieces. After marinading I drained it and fried it but it broke up and didn't take on any colour.as I supposed to have dried it? Some advice on different types of tofu would be helpful. I have only tried tofu a handful of times and, each time, cannot appreciate it. It know it has protein and therefore nutritional value but it never seems to bring anything to the party in my opinion. Am I missing something? I have completed the lesson but am wondering, upon reflection, why you stir fry ginger etc to season. Other videos just recommend oiling and burning this off. Is your method safer, perhaps? Is the smoke less likely to catch alight? I love stir frying as a quick and healthy meal for two but I don't like the fact that the cooking smells permeate my hair and clothes. Is there any way to alleviate this or do I just have to accept that a shower immediately follows a stir fry? 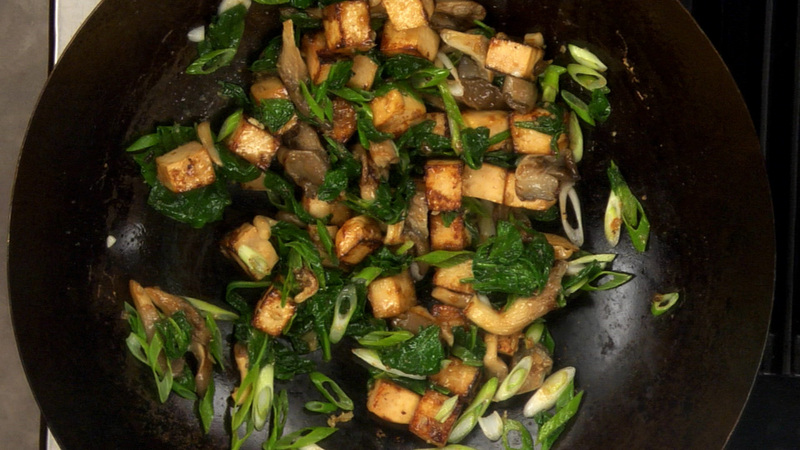 Hi, in step 3, the recipe says "add sauce" when you begin stir frying the tofu and before adding the spinach. What sauce does this refer to - the marinade? Yes, the marinade acts as the sauce, and the cornstarch will act as the thickening agent once it heats up. i made this recepie yesterday .It was very satisfying. LOVVVED it. Just two questions my tofu absorbed the dark soy colour and became a dark brown colour how can that be prevented and what is the reason of putting two different oils , sesame for marinating and peanut for cooking. how does it affect the end result of the dish?